What Makes for a Good Professional Art Easel? 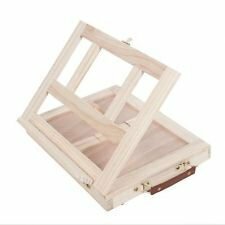 Are there any “tabletop” style artist studio easels? It’s never let me down-and as you can see, it’s well made. However there are lots of size ranges and great options out there. This large painting easel I own stands about 80″ tall at it’s highest point – yep, pretty big, but keep in mind it had to be assembled upon receipt. It was made with standing in mind (sometimes we need to stand more often than we sit) and to support all types of canvases. 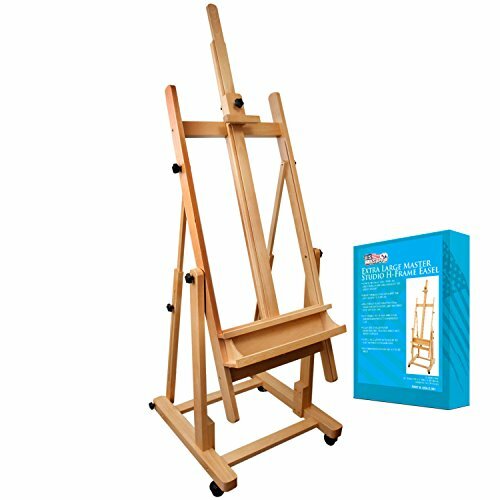 To get a good quality professional painting easel, you don’t have to seek out the most ginormous one – it is better to get hung up on sturdiness than size (unless you plan on using canvases 30″ or greater). You just need to choose one that’s sturdy enough to work as hard as you do! 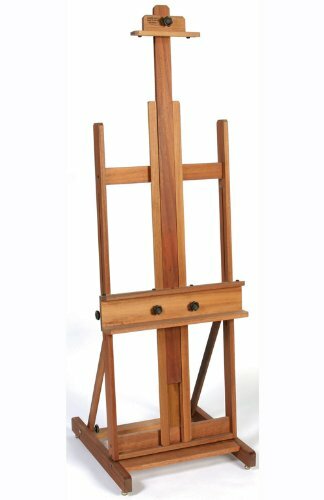 Moveability – My easel has an adjustable knob with which to lower the base part where your project or canvas rests, or raise it, depending on its size, and hold it securely. I just do lefty-loosey to lower it and move it down, and righty-tighty when I’ve got my canvas situated well, and it holds like gangbusters. Well-constructed – It should be made with quality materials, like beechwood; in general, easels made out of metal or aluminum are more like “starter” easels for hobbyists or just learning the ropes. Strong- You should not have to worry that your easel may tip over easily. I have had a few “tripod” shaped easels with a very minimalist design that were much better suited for displaying work but not actually performing the work! The best kind (mine too!) has a “h” shaped construction; most easels that are designed this way are very supportive and reliable. This layout will support the girth of your canvas very well. If you are looking at the style that has a tripod design, as I said in the earlier paragraph know that this is more likely to be used for displays or presentations (not art) and I’ve found them to be kind of shaky. I ended up giving away a tripod easel to my brother-in-law who was at the time using a light paper pad to practice sketching (a whole other megillah) The resting area can not be adjusted which makes them not a good choice for canvases. I have seen a number of easels with wheels for room-to-room mobility; this is definitely worth considering. I found myself envious as I wish mine did that! When I first started taking painting classes we worked on smaller, more portable tabletop easels-although they did have the aforementioned “tripod” design I’m discouraging, in terms of quality they were pretty sturdy as easels go. My instructor suffered from chronic back pain and understandably didn’t like to stand for long stretches of time painting. If you’re in a similar situation and more comfortable sitting, I would consider the tabletop tripods (but definitely go for wood instead of aluminum) but do keep in mind they are best suited for canvases 20″ and under. Since I am able to adjust the bar of my easel, I could take a break and sit while working; all I had to do was lower the bar down to be comfortable. There are some easels that have a “suitcase” approach – they also includes a storage bin or drawer to hold all your tools nicely. I’ve never had one myself but I like the look and design. They are made for more compact canvases, not much bigger than 14″. They are best for lifestyles with a lot of traveling. I hope this guide has been informative for you if you’re looking for a professional studio easel to go the distance with! If you are considering to buy an easel online, there will probably be some assembly required. But nothing over your head – if you have a screwdriver that may be all you need to have on hand, as did mine. In the case of the many large models over $100, free shipping is a good possibility. I used to own an easel. I had saved my money to buy it when I was in high school. I loved to paint, and was taking several art classes at local museums. I don’t actually know what ever happened to my easel. Or, my interest in art either. Hmm…. Thanks for bringing back some old memories! Great explanation. I have a daughter that is just beginning. Love the table top easel. I’ll have to check that out. Thanks for the post. It’s a good choice Tawnee, now it has been over a week that I’ve let this thing air out and it doesn’t have that funky smell as bad!